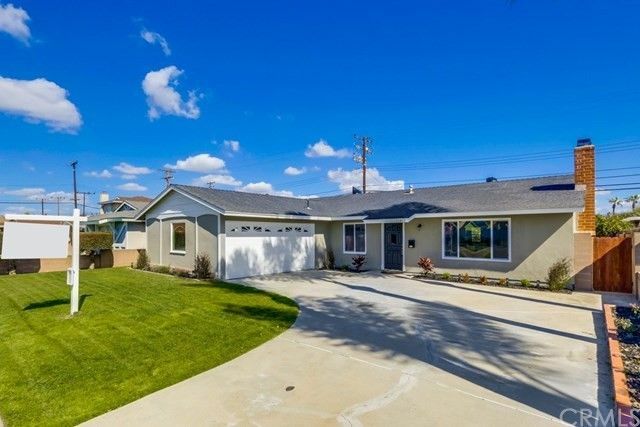 Beautifully, remodeled West Garden Grove, 4 bedroom & 1 3/4 bathroom home. Step inside and enjoy the open floor plan and attention to detail. Brand new kitchen featuring white cabinetry, custom back-splash, stainless steel appliances, stone counters, recessed and pendant lighting. Large living room with cozy gas fireplace is open to kitchen and dining for great entertaining possibilities. Wood flooring throughout. Both bathrooms completely remodeled. Newer composition shingle roof and new insulation. Front and rear yards landscaped with Marathon sod and automatic sprinkles. Roll-up garage door. Brand new forced air heating and air conditioning & new plumbing throughout. Washer and dryer hook-ups have been moved to garage. Close to park, great schools and nearby 405 & 22 freeway access.